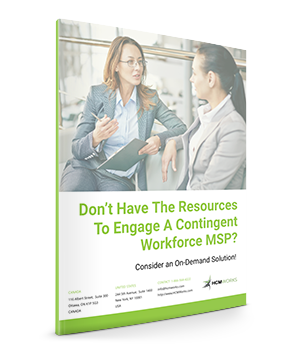 Don't Have The Resources To Engage A Contingent Workforce MSP? Have You Considered an On-Demand MSP Solution? A plug-and-play MSP solution could make the lives of CHROs, VPs of HR, Directors of Talent Acquisition, and Procurement Leaders a whole lot easier. This whitepaper delves into the many benefits of having a turnkey MSP that involves no cost to you and no major input from your IT teams. Download this free whitepaper to learn more about our plug and play MSP solution and how your business can benefit. Fill out the form and we'll email you a copy right away.